Members of the first class of HiAP Ambassadors. In 2017, the Institute for Healthy Air Water & Soil launched the Health in All Policies Ambassadors (HiAP Ambassadors) program in Louisville, KY. The goal of the HiAP Ambassadors is to bring together people of all ages and backgrounds to represent each petal of the Harmony Circle. The idea is for the Ambassadors to be bridge-builders among companies, schools, elected officials and government employees throughout the city. The Ambassadors advocate for a health in all policies approach whether it is at a personal, organizational, community, or state/federal level. This is a collaborative approach to improving the health of all people by incorporating health considerations into decision-making across sectors and policy areas. 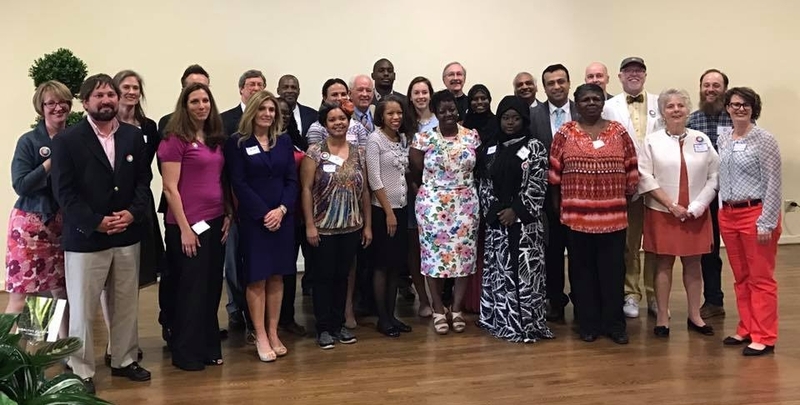 From environmental and financial health to spiritual and physical, the HiAP Ambassadors program has brought together two cohorts of more than 70 individuals. As an initiative supported by the Louisville Health Advisory Board’s Cultural/Social Impact Committee, we are excited to share how members of the inaugural cohort think about a Healthy Day – and its all encompassing impact across the networks where we live, work, worship, learn and play. To see a full list of the HiAP Ambassadors click here. We asked several Ambassadors what a Healthy Day meant to them – how does a good day make you feel? What would you do with a Healthy Day? When I wake up happy and energized, ready to tackle whatever life is throwing at me. A healthy day for me is when I’m happy and able to make someone else happy and that person is able to make some else happy and so on, a happy you is a happy neighbor and a happy neighbor is a happy community. Personally, a healthy day includes a full day of work at F&CP, coordinating and collaborating with staff, donors, funders, partners and policy makers to help ensure the children and families that need us the most receive exceptional services, assuring we have the resources we need to provide these critical services, and sharing the mission of F&CP with the entire community. Following work, a five-mile run helps to manage the stress of the day and get the endorphins flowing, and get the heart rate up. No gunshot wound victims, a Healthy Day. It begins after a good night’s rest and some time for prayer. A light healthy breakfast and walk to work, my residence is not far from the office. I try to get in as much walking as possible during the day, always a goal of 10,000 steps. Being an extrovert, the day also includes time socializing with students in our elementary school, and a time for non-work related conversation during lunch. The evening meal is the main meal of the day and it is one that is one filled with fresh produce and heart healthy protein in the meat selection. Evenings involve relaxing for at least an hour before going to bed, working the crossword puzzle to relax the mind and prayer before sleeping. A healthy day to me looks like a day where everything around me is positive. Everyone is on the same page where I don’t have go on the news and all I hear is about violence and hate. A Healthy Day is when everyone around me is having a good day where certain people don’t have to worry about anything going outside. A Healthy Day to me is when everyone is POSITIVE. Peaceful, rest, love, no hate, no racism. Needless to say, I have not seen a healthy day in a long time. It involves lots of fruits and vegetables! It also includes exercise or outdoor time, ideally in the garden. Whenever possible I like to create space for others to be healthy as well, especially through the teaching work that I get to do at the J. To me, educating others — especially youth, like our preschoolers — about health is a critical part of creating strong communities. A day when my “lived experience” of Louisville is one where I witness the care and celebration of one another as our highest priority and justice as our guiding value. A healthy day to me is being able to have a good meal with good friend with as little worries as possible and the ability to simply enjoy life.